Today, Friday 14 May, a deputation from London Coalition Against Poverty visited the South African High Commission to deliver a message in solidarity with their sister group in Durban, the shackdwellers’ movement,Â Â Abahlali baseMjondolo. Even with the world’s attention focused on their city, the group is experiencing massive repression and its leaders have been driven into hiding. The letter was delivered to coincide with the court appearance of twelve Abahlali activists, arrested during two days of massive attacks on their settlement. Amnesty International stated that an armed mob of 500 people attacked their community on 26 and 27 September last year, targeting members of Abahlali in particular.Â Â Not a single person has been arrested for this violence, yet the Kennedy 12 are still facing the courts â€“ with no evidence led thus far. 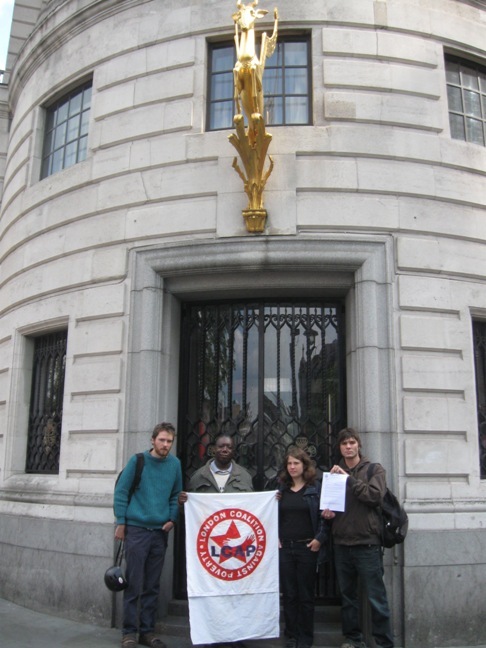 London Coalition Against Poverty was joined by members of War on Want today to deliver their message to the High Commissioner. They want the charges against the Kennedy 12 to be dropped and the five activists to be released from prison.Â Â They are also calling an independent and credible commission of inquiry into the attack and ongoing intimidation in Kennedy Road. Justice for the Kennedy 12! Today twelve people will appear in court in Y Court, Durban. In our view they were arrested not because they committed any crime, but because as members of Abahlali baseMjondolo they demanded justice for their community at Kennedy Road. Their experience of the justice system so far has been appalling: Five of those in court have been held in Westville Prison since September last year. None of their court appearances this year have been recorded. Their defence lawyer has been denied access to police dockets and records of past hearings. They and their family members and supporters have been threatened, both inside and immediately outside the magistrate’s court. No evidence has been led in court to connect the Kennedy 12 with the two deaths that occurred on the night of September 26. These arrests should never have taken place. They happened in the wake of violent attacks on Kennedy Road on 26-27 September 2009, of which police and local politicians were aware but did nothing to intervene. The perpetrators of this violence, which has driven the leaders of the movement into hiding, have never been pursued. Next month, the whole world will have its eyes on Durban. We want you to know that ours are on Kennedy Road and on the treatment of our sister group who dare to demand justice despite the repression they have faced. Please take immediate action to ensure that the charges against the Kennedy 12 are dropped and the five activists are released from prison. We join Abahlali baseMjondolo in calling for an independent and credible commission of inquiry into the attack and ongoing intimidation in Kennedy Road.